Welcome to the final edition of my link review for 2013! I was busy finalizing my annual end of year development blogging review (see below), but now it's time for some links, things and thoughts you may want to read as you are heading out to connect with loved ones for the holidays! There is a great new guide on children's participation as well as harrowing insights into human trafficking from Eritrea and the how girls have become a 'disposable' commodity in Colombian narco culture; there is more on humanitarian complexities in Ethiopia, complexity theory, mobile phone data use and insights into the gangs of Chicago; Reflections on women technology writers and Twitter scholars, a lecture on the global expulsion through capitalism and the myth of going to college to 'provide' in a meaningful way wrap up the review. Enjoy--but more importantly: Have a great holiday time and a happy New Year! It is a bit hard to believe that this is already my third annual personal development blogging review after 2012 and 2011! As difficult as it is to come up with a ‘theme’ or ‘trend’ for an entire year (in 2011 I wrote about bloggers leaving and writing for a growing student audience, in 2012 the K-bomb dropped...), this year’s apparent absence of the one big event may actually be a good sign; consolidation sounds rather unspectacular as many bloggers continue their work, research on development and social media gains momentum and many aspects of aid and aid work are almost naturally discussed in connection with blogs and social media. It is now clear (at least for me) that the virtual domain is the marketplace where theory and practice, reflections and snark or news and rumors meet. No surprises there. I totally forgot to celebrate blog post #250 last week! But in fact my book review of Chouliaraki's 'Ironic Spectator' marked yet another blogging anniversary this year. Yeah! This week's review breaks a little bit with the conventions to keep things interesting...there are fewer links this week, but I included a 'special section' and a longer comment on the 'Biopolitics of academic publishing' at the end. But before that, some new items on development & anthropology, featuring a new critical documentary on the WWF, hypocritical awareness and investments, a great discussion on 'Does aid work? ', insights from the social entrepreneurial gift economy & design for development. In June 2011 I wrote on The WWF and the industry-What role for environmental organisations in the age of multinationals and biofuels? I noticed that my reading habits are changing as I am becoming more immersed in academic teaching, course planning and advising MA students on a variety of assignments for our Communication for Development program. I am discovering more and more new literature that not just helps me in my research and writing, but also helps me pointing students into the right direction for their reading and own reflections. 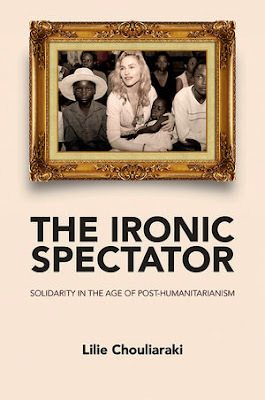 Celebrities’ involvement in development and humanitarian issues is clearly a trending topic and more and more research and publications are engaging with numerous issues around celebrity discourses in the global market of development (re)presentations.